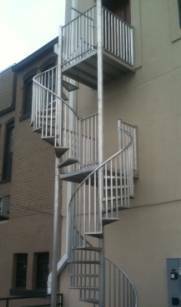 This stair is a 48 inch diameter aluminum welded stair shipped in two sections and is non code compliant. The Customer presented us a unique application with doors on a wall above each other. In order to accommodate larger landings for door access, we designed two spiral stairs utilizing two different center columns. A one column design was discussed however the customer liked the unusual characteristics of this double column design.